This tight weave fibreglass screen by Everbilt is the perfect solution for keeping small insects out while still providing high visibility and airflow. Flexible and lightweight, this high quality mesh is crease-resistant, easy to install and makes great screen protection for windows, doors, and balconies. Available in black. 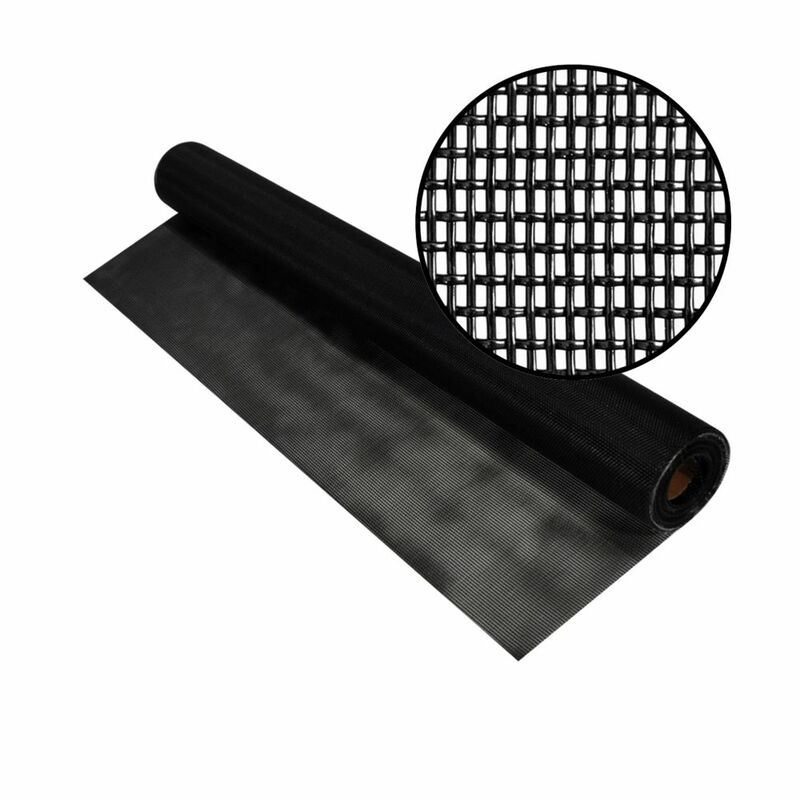 36-inch x 50 ft. Black Pet Screen This heavy-duty, pet-resistant insect screening is seven times stronger than regular insect screening and has many uses. It is ideal for screen doors and porches where extra strength and protection is desired. It is an excellent choice for high traffic areas where pets come and go. 36-inch x 50 ft. Black Pet Screen is rated 4.8 out of 5 by 21. Rated 5 out of 5 by TexasScreen from So far so good!... So far so good! Rated 5 out of 5 by MizFin from This was very easy to work with. So easy, I... This was very easy to work with. So easy, I was able to rescreen all 8 of my windows! It had the flexibility and sturdiness needed to keep the screen in place while rolling the spline. Great buy and I would recommend this to everyone. Rated 5 out of 5 by Ali2576 from Excellent Durability Purchased online a little over a month ago for a cat patio for our 2, 10 month old rambunctious kittens. Very durable product. The kittens climb on it, withstands strong wind, hail, looks good provides some shade inside for kittens and privacy from outside. Happy with the purchase. Rated 5 out of 5 by Spot from So far, so good. The squirrels have not damaged it. So far, so good. The squirrels have not damaged it. Rated 5 out of 5 by CatGuy from This screen is great for preventing my cats from tearing though the screens. It is tough! even h... This screen is great for preventing my cats from tearing though the screens. It is tough! even hard to cut with a razor knife. It's a bit difficult to roll in the spline because the screen is a bit heavier than normal. Rated 5 out of 5 by Geri from It is great! Went up easy and our builder... It is great! Went up easy and our builder said he would use on all his other jobs now! Rated 5 out of 5 by tlynnet from Pet Screen I built a new screened-in room and installed a different screen and the first day it was completed a bird bumped into it and put a hole in it, needless to say not very happy after all that work! I found this pet screen online and replaced every panel with this instead and I love it. It was easy to work with, looks great, it's durable and I am confident my pets won't cause any problems if they happen to jump on it. Would definitely use this type of screen again.